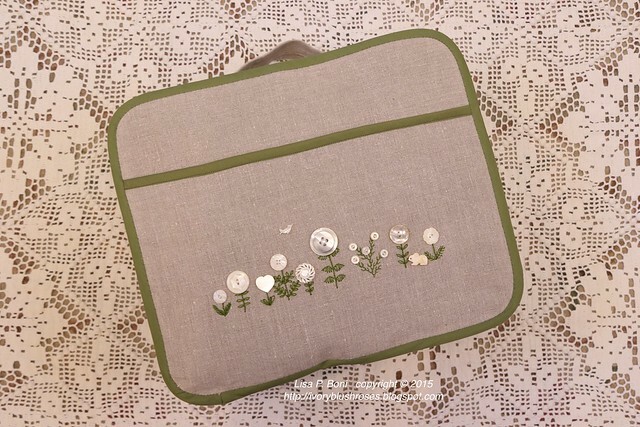 With several trips coming up, a couple of which involve taking my stitching projects and accompany accoutrements, I wanted a case to keep everything contained in a lovely manner. My daughter and spent an evening looking through pattern books for something that I could modify without having to reinvent the wheel and discovered a Simplicity Pattern (#1238 os) for a doll case that was just the kind of thing that I was after. I had several fabrics to choose from, and ended up going with my favorite natural linen trimmed with green. 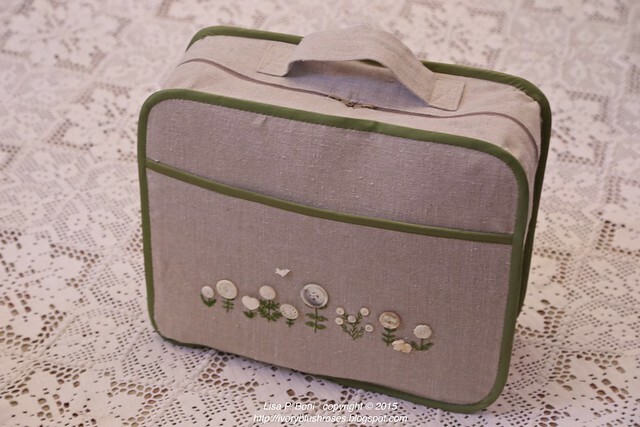 In the past, I have made several cosmetic bags, that I use when traveling, from the same fabrics that are also embroidered with the same type of button flowers. I only had to make a few minor modifications to make the case work for my purposes! Mostly I added the front pocket that can stash a handout or small project, and widened the sides by about 1 1/2". Inside, I eliminated the doll accoutrements and bed that the pattern called for and instead added some elastic straps to hold thread and bead cases in place more securely. Eventually, I would like to add a shoulder strap to it, but that will happen down the road. One of the things I love about it, is that when fully loaded, it actually stands up on its own! The overall size is 14 1/2" tall x 17" wide x 6" deep. When opened, it lays out flat, so I'll be able to put it at my place and have everything I need within easy reach and somewhat organized! I'd like to add two "packing" style cubes to this to contain some of the smaller items. There's even room for my small battery operated LED OTT light! 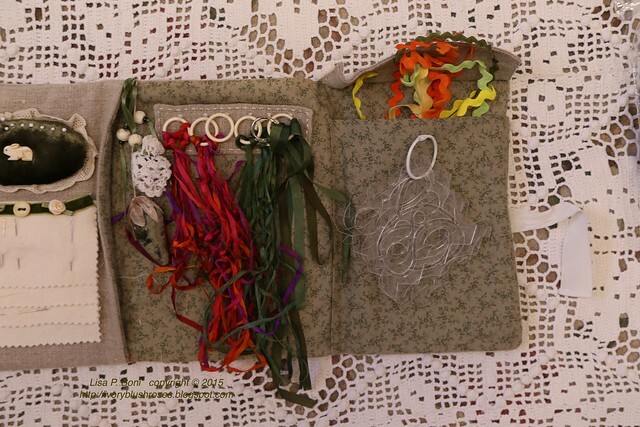 On the right side, there is a plastic case of the beads I am using on my CQJP 2015 project, my stitching book, a velux bead mat, a bag of stitching threads on metal rings and several bags containing projects I am currently working on. On the left , there are two plastic cases for threads. One contains an assortment of embroidery threads, particularly variegated varieties, which I really love in CQ work! The other contains an assortment of pearl cotton spools for the projects I am working on. There is the small battery operated Ott Light, my pincushion, a pouch containing large scissors, pens, pencils, disappearing ink markers, a small ruler and a 4" embroidery hoop. I've also included two little fabric baskets, one of which contains some bead-mixes that I'm using on my current projects and the other contains a ring of embroidery threads and silk ribbon that I'm using on my current CQJP blocks. There is also another little stack of beads that didn't fit in the other case. 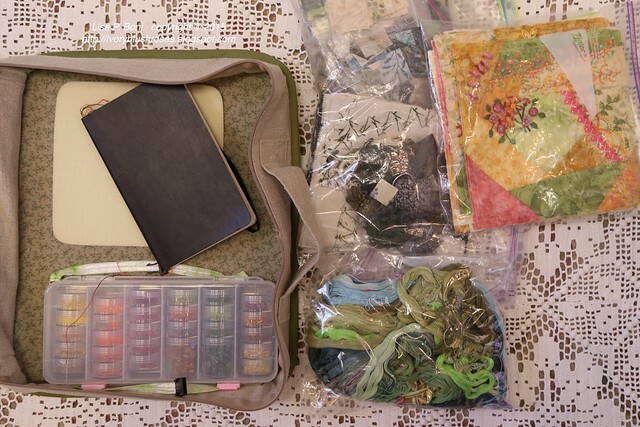 Lastly, you can see my Hussif, which contains the basics of all my sewing tools, and which can also be used separately as a mini-needlework pouch that fits in my handbag. I posted much more about my Hussif when I was making it back in 2009. Here is the inside of the Hussif now. Assorted needles and pins on the left. On the right, small embroidery scissors, some bone sewing implements and laying tools, a tatting shuttle, and a micron pen and needle threader. The left flap opens out and reveals rings to hold thread or in this case, silk ribbons. 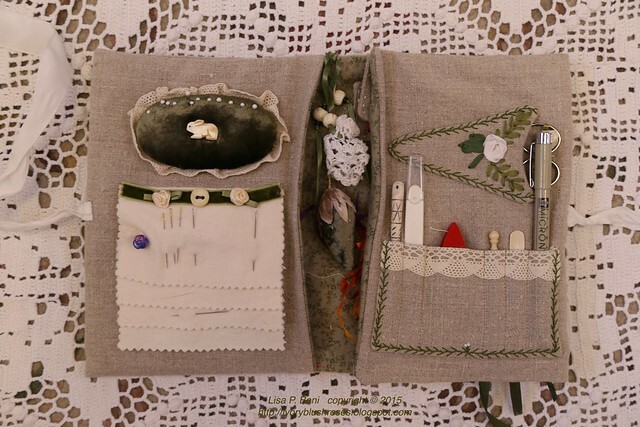 The pocket under the pincushion/needle area is where I keep my set of Sharon Boggen CQ templates (my favorite, other than the old Dritz scalloped ruler that is in the scissor pouch), and the pocket on the right I use to contain miscellaneous bits. If I'm using the hussif separate from the big satchel, it might contain the block that I am stitching on at the moment. The bit of lace towards the left is actually a small pouch that contains my thimbles and the green velvet strawberry underneath is filled with emery to smooth rough needles. Altogether, the hussif measures about 8" x 6" x 2" when folded and about 8" x 18" when unfolded. Small enough to drop in my (large) handbag, but large enough to contain the basics I need when working on a simple CQ block or piece of embroidery. 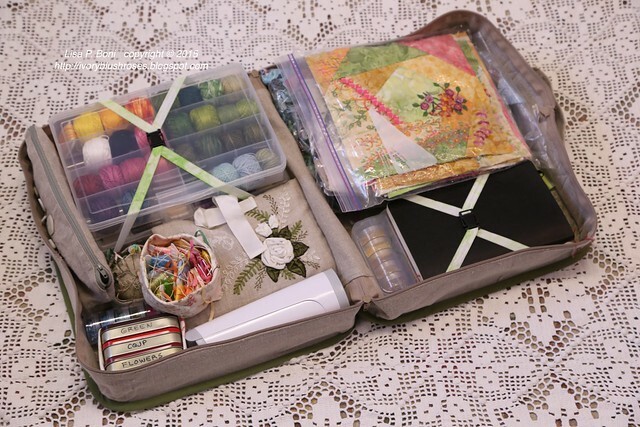 I like the fact that I can also use it in the larger satchel as well without having to come up with other solutions for holding the miscellaneous small stuff that goes with most stitching projects! The big Needlework Satchel fits neatly in my suitcase or could be used as a small carryon bag by itself if I choose to. If I use it as a carry-on, I'll put the pouch with the large scissors and the Ott Light in my checked bag, so I don't lose them to the TSA! 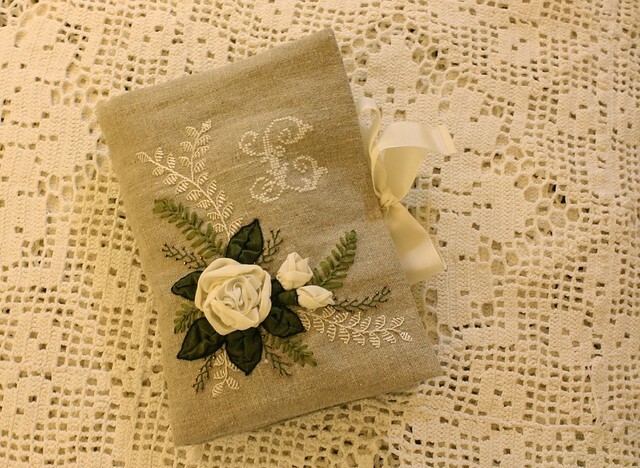 I'll let you know how it all works when I come back from April's Slow Stitching retreat in New Jersey! Pretty & practical. Beats my "baggies"
That's a perfect case!! I would love something like that instead of carrying a plastic box that does the job but looks boring. I'm sure you could sell these quite easily!! Lisa, this is a wonderful piece(s)! Love it! Very nice compact way to carry everything you could possibly need, the craftsmanship is beautiful such a compliment to your obvious talents. 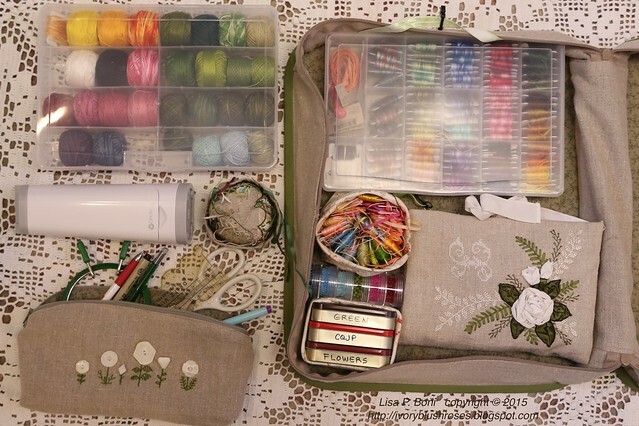 Wow, what a beautiful, organized carry all for your needle working-on-the-go. You never cease to amaze me with your skills. This is just gorgeous. You are truly a talented seamstress. Love the color scheme, so simple and appealing. Wow everything is at your fingertips! Beats my canvas tote that I just throw everything in! Beauitful case! Absolutely brilliant!! How incredibly put-together and completely organized of you! I dream of having my act this together one day. It's so refined and lady-like. I'm afraid I'm a terror and forever throwing stuff into a bag and flying out the door! I have a great deal to learn from you, I see. Can't wait to meet your traveling case in person. What a joy to see!